Mark’s Deli and Coffee House brings a taste of the Big Apple to the upscale confines of Palermo Soho. Here you’ll find stacked made-to-order deli sandwiches on home-baked breads, an interesting variety of salads and specialty coffee drinks being dished out to a constant flow of cash splashing Palermo elite and guidebook-toting foreigners. The refreshing selection of bread at Mark’s includes normally scarce options such as whole wheat and rye and cheese or black olive baguettes. Two particularly tasty sandwiches, made with the customer’s choice of bread, are the pastrami, cucumber, pickles, lettuce and Dijon mustard and the grilled chicken, made with apples, pancetta and blue cheese. All sandwiches can be toasted to warm things up in the winter months. The healthier options at Mark’s Deli are the fresh salads. The most exquisite is the fresh Special Salad: smoked salmon, Brie and arugula. Both sandwiches and salads are large; true to American style, the notion of a snack doesn’t exist at Mark’s Deli. To wash it all down try the homemade lemonade or fresh fruit smoothies, the kiwi is a particularly flavorful. Specialty coffee drinks include the Iced Mocha, or for something with a little more guts, the Absolut Vanilla Coffee. A large teatime and dessert menu includes muffins, brownies, chocolate chip cookies and baked tarts. The best on the menu though is the cheesecake. The texture is as thick as you would find in New York and the biscuit base is not too sweet. A zesty fruit coulis finishes off the order and as with everything at Mark’s Deli, the portion is large enough to share. 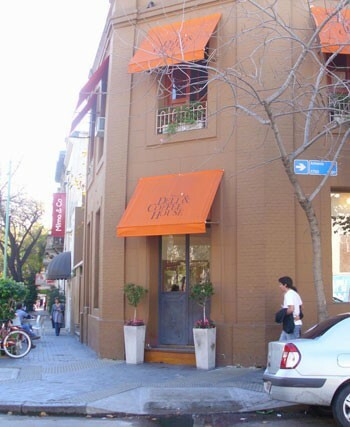 The U.S.-style business model is so well emulated here that one might suspect that Mark’s Deli is a foreign-owned enterprise, but it is the brainchild of Argentine, Marcos Mantecón who brazenly opened up the cafe in 2002, shortly after Argentina’s devastating economic crisis. Mantecón’s idea proved to be an immediate success, especially among the growing number of foreigners in the area. Today, waiting for 20 minutes to be seated at Mark’s is not uncommon, particularly between 2pm and 5pm on the weekends. This considering that there are twelve tables inside, a breakfast bar and an outside patio area, accommodating another five tables. One drawback for the near-sited is that there is no menu that you can hold in your hand here — you’ll have to crane your neck from your table in order to read the menu options, written on two blackboards above the service counter. Another is that the quality of the services varies more than the food. Although Mark’s may seem on the pricey side for residents (and only accepts cash) the deli is fresh, the portions are generous and in straight-forward New York style, there’s no service charge.